Western European car sales are predicted to fall 2% to 12.5 million next year and could plunge to 11 million if the region enters a recession. MILAN -- Alessandro Cardini may benefit from the desperation gripping debt-plagued Italy by holding off on replacing his 10-year-old Opel Corsa. The 40-year-old manager from Milan had planned to buy a new car for months. Now, with the Italian government falling apart in the face of austerity measures and soaring debt costs, he'll hold off a little longer in hopes of getting a steeper discount from hard-up dealers. Such decisions are creating a "vicious circle" for the auto industry, according to Italy's Federauto, the nation's association of car dealers. "We may pay a lower price for a new car next year, so it's worth it to wait a couple months," Cardini said. "The crisis will make dealers even keener on giving a higher discount." Italy's slump is hitting the European auto market hard because it ranks behind only Germany, France, and the U.K. in terms of vehicle sales. Car deliveries in Italy, home to Fiat, tumbled 11 percent through the first nine months of 2011, fueling a 0.9 percent dip in the region's auto market, according to ACEA, the European automakers association. Fiat shares have lost 39 percent this year, giving the company a market value of 5.14 billion euros. General Motors Co. this week abandoned a goal of breaking even this year in Europe, where it makes Opel and Vauxhall models, as economic conditions in the region deteriorate. Fiat, which sold about 30 percent of its cars in Italy last year, is struggling to end losses in Europe estimated by analysts at 800 million euros ($1.1 billion) annually. "Producers may survive this crisis thanks to their sales in other markets, such as Brazil and China; dealers can't," Filippo Pavan Bernacchi, head of Italian dealer association Federauto, whose family has been selling Fiat vehicles near Padova in northern Italy for over 60 years. "Some dealers are cutting jobs; others will disappear. We are in a vicious circle. We are destroying ourselves, one against the other," he said. Discounts range between 10 percent and 20 percent on new cars and can be as high as 35 percent on so-called zero-kilometer vehicles, which are new cars that have been registered as used so they can be sold at a lower price, Bernacchi said. 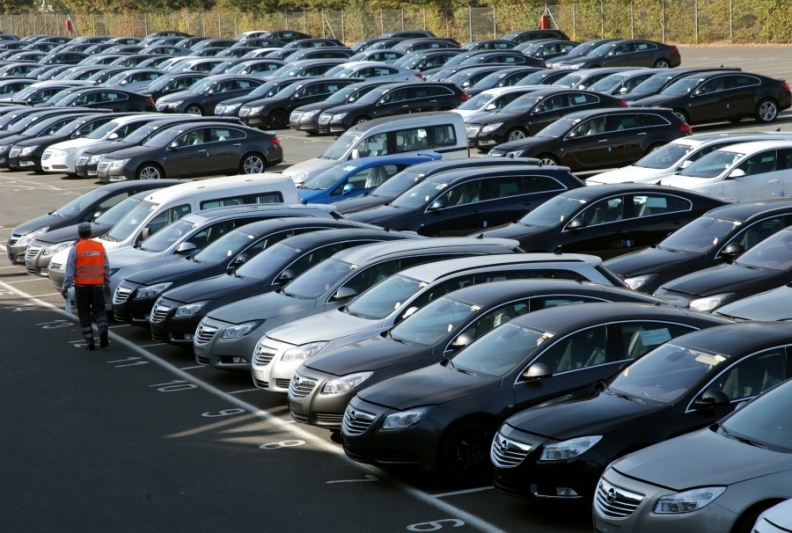 Automakers are also being forced to discount their cars in other European markets. PSA/Peugeot Citroen reported a 1.6 percent decline in third quarter auto revenue after pricing in Europe deteriorated "dramatically" in September. "We resisted the pressure on pricing, which affected all car segments, but in September we had to respond" to defend market share, said Jean-Baptiste Mounier, a PSA spokesman. In the U.K., incentives are on the rise, with Mazda offering zero-interest loans and discounting the equivalent of the 20 percent value-added tax on the Mazda 6 sedan. VW's Audi is offering discounts of 15 percent, above the 10 percent range during the 2009 crisis, according to Richard Sanders, managing director of U.K. discount car website drivethedeal.com. Western European car sales are predicted to fall 2 percent to 12.5 million vehicles in 2012 and could plunge to 11 million if the region enters a recession, said Jonathon Poskitt, an analyst at LMC Automotive in Oxford, England. Manufacturers sold 14.8 million vehicles in western Europe in 2007. "If you run into an economic crisis, private investment into cars is always the first that is affected -- first the car and then furniture," said Wolfgang Stoever, head of sales and marketing at BLG Automobile Logistics GmbH, which operates the Bremerhaven car shipping terminal, Germany's largest. "The European market continues to be incredibly unrewarding," Fiat CEO Sergio Marchionne said in a conference call on Oct. 28. "The Italian market itself is going to see volumes we have not seen since 1996. We have somehow lost 15 years' worth of market growth." Exports of cars from Volkswagen, BMW and Daimler's Mercedes-Benz brand have risen more than 30 percent through October as the manufacturers seek sales in growth markets outside their home region, Bremerhaven's Stoever said, predicting stagnant demand for German cars in western Europe. "All manufacturers are playing the game," said Sanders. "Every month they seem to edge up discounts. It's not just the volume makers but the luxury boys as well." Even in Germany, where car sales have climbed 11 percent so far this year, the supply of vehicles is creeping up as deals get harder to close, according to Robert Rademacher, president of the German dealer association ZDK. "The shortage of cars has disappeared," said Rademacher, who's been in the auto sales business since 1969. "There now seems to be too many cars, which is causing discounts on a very high level." Incentives "got a little more aggressive during the third quarter," Stephen Odell, chief of Ford's European operations, said in an interview. "That matches the fact that the industry has declined. It's also when the concern really started to bite."